I stalk the Taylored Expression blog fairly regularly. I've always wanted to try one of her cupcake challenges but every time I look at a sketch my creative mind shuts down. I gave this week's challenge a try. So here is my creation for Taylored Expression's Cupcake Challenge #28. Card stock and stamp are from Stampin' Up!. The brass brad is from Hobby Lobby. The designer paper is by Making Memories. I used pink stardust pen to shade in the flowers on the stamp. Thanks for stalking! 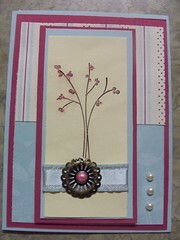 =) I LOVE that card and hope that you will be inspired next week as well!! Thanks so much for playing...great work!